2 new services for renting electric scooters have appeared simultaneously in Moscow, and are based on the car sharing principle. Russia Beyond explains how you can rent one, how much it costs, and what you should know beforehand. The morning of May 19 heralded a new era for ground transportation in Moscow. In just one day more than 20,000 users signed up to rent electric city scooters, which have cropped up around the capital. 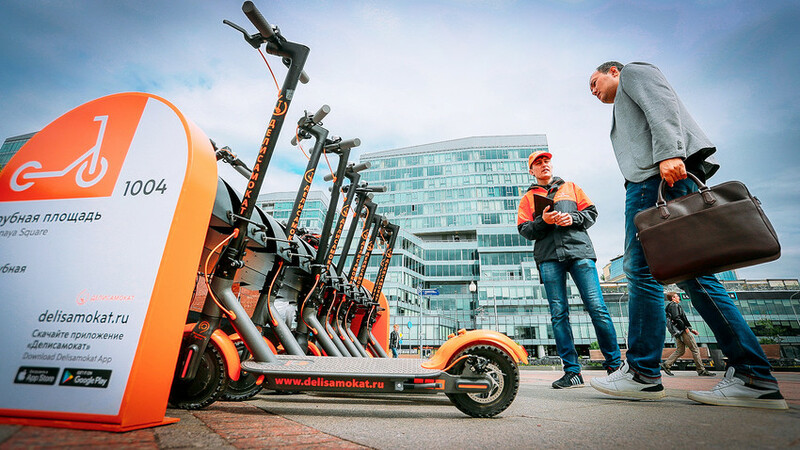 Two car sharing operators (Delimobile and Youdrive) launched rival scooter services on the same day: Rental points are located across the city, users pick up a ride at one of these stations, and return it at the end of their journey. At first glance the service appears almost identical to bicycle and car rentals, but it is not. This is how it works. The main advantage of Delisamokat is its cheap price and accessibility. One hour of rental will only cost 100 rubles ($1.6) and renting it for the whole day will amount to 450 rubles ($7.2). It takes one hour to go around the center of Moscow on the Garden Ring so you get a lot of bang for your buck. Currently the service has points near all the central metro stations, as well as in Moscow’s northwestern and southwestern outskirts. In total there are 25 stations and 1,650 scooters. The only limit is that you can’t rent the scooter at night. The stations opens at 7 a.m. and closes at 11 p.m., and the scooters are given out by human operators (who also check their condition upon return). Delisamokat scooters gradually increase speed with the push of an accelerator button. The maximum speed is 25 km/h. It also folds and has big wheels, meaning it is pretty stable. However, it should not be ridden through deep puddles or when it’s raining. Delisamokat scooters gradually increase speed with the push of an accelerator button. The maximum speed is 25 km/h. - First you will have to register on the app and fill out a form. It can be downloaded from the official site or at an App Store. The account is linked to a phone number so you will receive an SMS with confirmation. - Afterwards you will have to download and sign a user agreement and upload a scanned copy onto the system. - The next step is to enter your passport information. You will have to upload the passport (the centerfold with photo) and a selfie with the opened passport. You will also have to put your signature with your finger on the smartphone screen. - Now wait. The activation will take some time (usually a day) while administrators check your documents. - As soon as your application is approved, you will receive a confirmation on your email or phone. 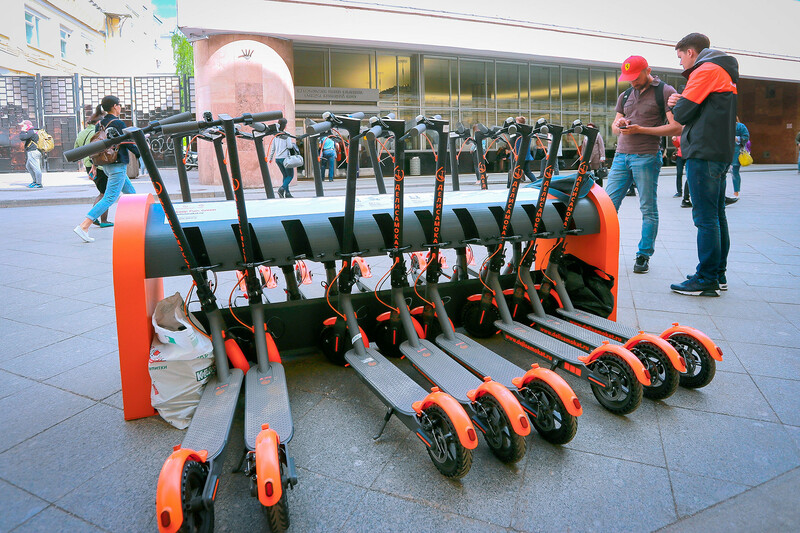 First, it must be reserved through the app, which shows how many free scooters there are and at which stations they can be found. Then you can pick it up at the station, having scanned the QR code from the app. That’s it. If you are renting the scooter for the whole day, ask for a lock and charger. They are free. What should you do if you can’t return it on time? It is better not to forget. 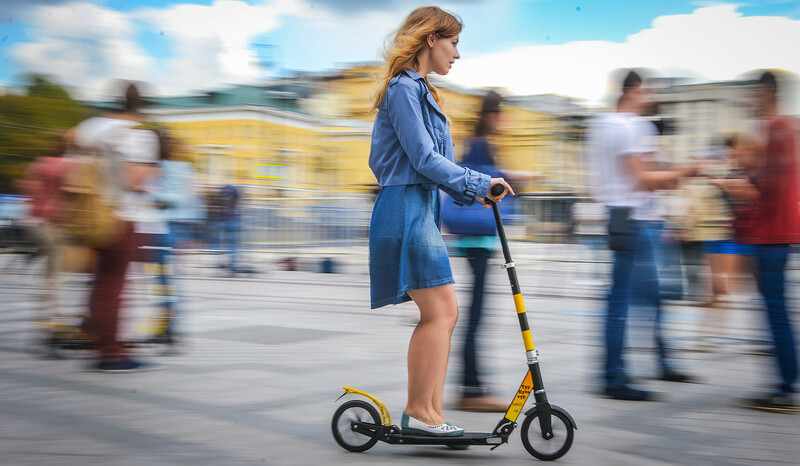 If you return the scooter the following day, you are charged 5,000 rubles ($80) and the service automatically renews the rental for the whole day. If you do not return the scooter within 48 hours, you will be fined 30,000 rubles ($480). Maximum speed is 25 km/h! This rental service has neither an hourly nor a day fee. You pay by the minute. One minute costs five rubles. One hour will cost you 300 rubles ($4.8). All the stations are located in the city center (within the Garden Ring). With this service it is also forbidden to use the scooter when it is raining. However, this electric scooter is autonomous and it can be rented at any time of day. It has the same maximum speed as the Delisamokat (25 km/h), but there are two other speed modes. Battery power lasts for 20 km. This service has much less paperwork. If you have an account with YouDrive, you do not need to do anything else. There is a single bill. If you don’t, download the app and register with the car sharing service. The service says that all you need is a “passport and a clear conscience.” Authorization takes about two hours. Yet, there is one big drawback: The service does not have an English-language version like Delisamokat. You need to find the closest station, scan the QR code on the scooter’s wheel, and open the Bluetooth lock with the help of the app. Basically, that’s it. In order to link the scooter to the time, you need to use the same integrated lock and app. A stranger will not be able to unblock it without access to the account. The scooter can also be charged autonomously because it has a built-in accumulator. In order to leave the scooter at the station and end the rental time just scan the QR code of the parking lot.